Bee Haydu, shown on a wing of a Ster-	man PT-17	while serving as a flight	instructor	in WWII. For every combat pilot serving at the front during World War II, getting five down and glory, there were a dozen service pilots quietly working behind the scenes, training new fliers, delivering aircraft, testing out new designs. 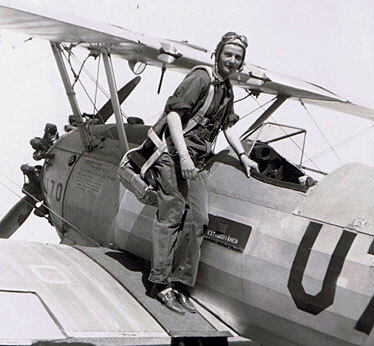 The demand was so great that the Women Airforce Service Pilots, or WASPs, were created, putting women in the pilot's seat. 2 p.m. Sunday and 7 p.m. Monday at the Pacific Aviation Museum, with book signings before and after. Reservations and information about accessing Ford Island: 441-1008. Admission to the museum is $14 (discounts for children, kamaaina and military, free for members). Bernice "Bee" Falk Haydu was a "Depression kid going to night school in Newark" when she heard about the program. The one hitch - civilian flying was banned over New Jersey near New York at the time, and the nearest flight school was in Pennsylvania. "So I Greyhounded back and forth," recalled Haydu. "And eventually soloed in a 65-horse Taylorcraft." Haydu and other WASPs living in the islands will be at the Pacific Aviation Museum Ford Island on Sunday and Monday to speak about their experiences. The "glass ceiling" cracked by Haydu and others was at several thousand feet. Because of lobbying by male pilots, the WASPs were disbanded during the war and their records sealed. Not until 1977, when President Jimmy Carter signed the GI Bill Improvement Act, were the WASP veterans accorded full military status. At the time, Haydu was president of the WASP veteran's organization. It wasn't all pleasant skies. Dozens of women pilots were killed during the war, including Cornelia Fort, who survived flying during the attack on Pearl Harbor only to become the first American military female pilot to be killed - when another pilot dropped his BT-13 trainer on top of her canopy in flight. "About 50 percent of the women washed out during training," said Haydu. "It wasn't that they weren't capable, it's just that they had to learn on the very brief timetable set up by the military." Once she earned her wings, though, Haydu said, she found "it's simply beautiful to fly. You're there among the clouds, with an incredible sense of freedom and power." WASPs were funneled either into the Ferry or Training commands. Haydu became a flight instructor, spending much of her flight hours behind the control of the UC-78 "Bamboo Bomber." Her biggest regret of the war years was that her unit was disbanded just a few days before being assigned the hot B-25 bomber. Postwar, "it was difficult for any pilot to get a job in aviation, there were so many," and so Haydu started a ferry business that grew into a Cessna dealership and a flight school. Her husband, naturally, also was a pilot. Haydu stopped flying only a few years ago, and has written a book about her experiences in the wild blue yonder.